We’d love your help. Let us know what’s wrong with this preview of Once A Gambler by Miikka Anttonen. Miikka Anttonen started gambling when he was ten years old, when most kids were playing with Pokemon cards and PlayStations. Throughout his teens, he spent long nights at the library analyzing sports betting odds, resulting in many large wins - but on the flip side, his "hobby" also led him to drop out of high school. The Escape is a journal of those early days discovering Miikka Anttonen started gambling when he was ten years old, when most kids were playing with Pokemon cards and PlayStations. Throughout his teens, he spent long nights at the library analyzing sports betting odds, resulting in many large wins - but on the flip side, his "hobby" also led him to drop out of high school. The Escape is a journal of those early days discovering gambling, awkward prom memories, growing pains, and most importantly that magical night when Miikka first found poker, and with it his destiny, at twenty years old, in the most unlikely of places. To ask other readers questions about Once A Gambler, please sign up. I finished reading this a couple of weeks ago and I enjoyed it immensely. I thought the author's use of the present tense was an interesting stylistic choice, as it added a charming naivety to proceedings, as it gave the memoir the flavour of a teenager's confessional journal. The story arc is that of a coming of age novel, and the shortish chapters allow the action to unfold at just the right pace to keep the reader going back for more. Like some sort of Boy's Own adventure, it prosaically tells I finished reading this a couple of weeks ago and I enjoyed it immensely. I thought the author's use of the present tense was an interesting stylistic choice, as it added a charming naivety to proceedings, as it gave the memoir the flavour of a teenager's confessional journal. The story arc is that of a coming of age novel, and the shortish chapters allow the action to unfold at just the right pace to keep the reader going back for more. Like some sort of Boy's Own adventure, it prosaically tells you "What hero did next", but simultaneously has you screaming "Oh no, he didn't!" The occasional mentions of the music Miikka was listening to on his mp3 player (Bright Eyes, Interpol) got me all nostalgic for the mid-2000s, as I was listening to the same bands, reading the same books (Palahniuk), and going through the same "girl trouble" and similar existential crises as he was, although I have to say I was never attracted to the roulette wheel. 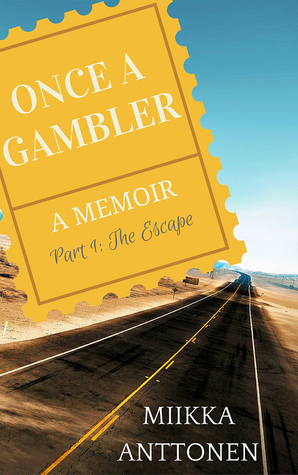 Late last night I finished reading part 1 of Once A Gambler: The Escape. I must give it to you Miikka “Interpol” Anttonen, you write a very capitative story of your early life. I believe you really describe the feeling of a non-belonging that a lot of young kids feels today. You also, capture all the elements of compulsive gambling, the scary side of the game, degenerates like me and many other do recognise a lot of the decisions you made in your life, luckily things usually always end up good. T Late last night I finished reading part 1 of Once A Gambler: The Escape. I must give it to you Miikka “Interpol” Anttonen, you write a very capitative story of your early life. I believe you really describe the feeling of a non-belonging that a lot of young kids feels today. As someone with extremely limited poker experience, I wasn't sure if I would like a book written by a professional poker player about his life -- but I was hooked within pages and it kept me engaged for the entire couple of days that I was reading it. It's remarkably open and honest, and despite the author's young age, you can tell that he's really experienced a lot - and learned from it. It's truly a glimpse into a different world. Highly recommended, can't wait for the next part! I read the book in five hours, couldn't put it down despite already knowing quite a bit of the story from Miikka's earlier blogs. It's a captivating read. My only complaint is the slight lack of poker action, I thought there would be more, but I assume the future parts will be full of it! Couldn't put the book down. Took you on the highs and the lows of a poker players career, gives a good prospective. I'm a little bit biased because I know Miikka personally, but this really is a great story and really well written. Highly recommended to all gambling buffs out there!